Casa Palopó at Lake Atitlán, Guatemala. Shelley Seale photos. It was my first trip to the beautiful and friendly Central American country of Guatemala. I had just spent a few days in Antigua and was on my way to Lake Atitlán — a deep volcanic lake in a massive crater in the highlands of the Sierra Madre mountain range. Many little villages dot the banks of the jewel-blue lake, and the green hills and imposing volcano peaks rise up around it all. Arriving at my destination, Casa Palopó, I could barely concentrate on the friendly staff greeting me and getting me settled in my room and to lunch. 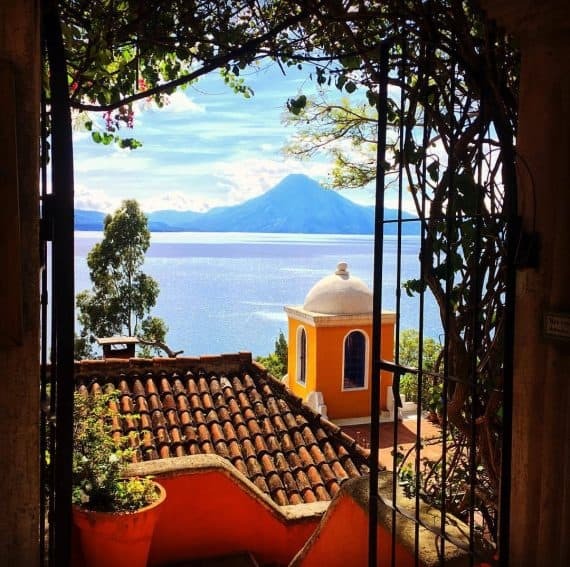 I was too distracted by the views: situated on a hillside overlooking Lake Atitlán, the living room and terraces looked out over the water and opposite shores in vistas that were nothing short of stunning. Perched in this spectacular fashion, Casa Palopó is a place for relaxation on the banks of one of the country’s greatest draws. This special place is a former private estate that is now an exclusive hotel. This retreat for sophisticated travelers offers both a boutique hotel experience as well as a detached, private villa. Rich Guatemalan colors, art, furnishings, and heirlooms surround guests with the unique Mayan culture of Guatemala. Stucco walls painted in deep, jewel tones of blue and orange, combined with the spectacular location and views make this a place that simply would not be found anywhere else in the world. Casa Palopó embraces the local culture and history, while at the same time providing a level of discreet, upscale service that makes guests feel as if they are staying in a private home. Guest room at Casa Palopó right on Lake Atitlán, Guatemala. Fifteen private guest rooms evoke Mayan heritage with their furnishings, indigenous artifacts and décor. Wooden beams overhead and polished wooden floors complement the vibrant walls and furniture. Comfortable beds are made with top-quality Italian linens. Private terraces are furnished with small tables and cushioned lounge chairs to soak up the amazing views. 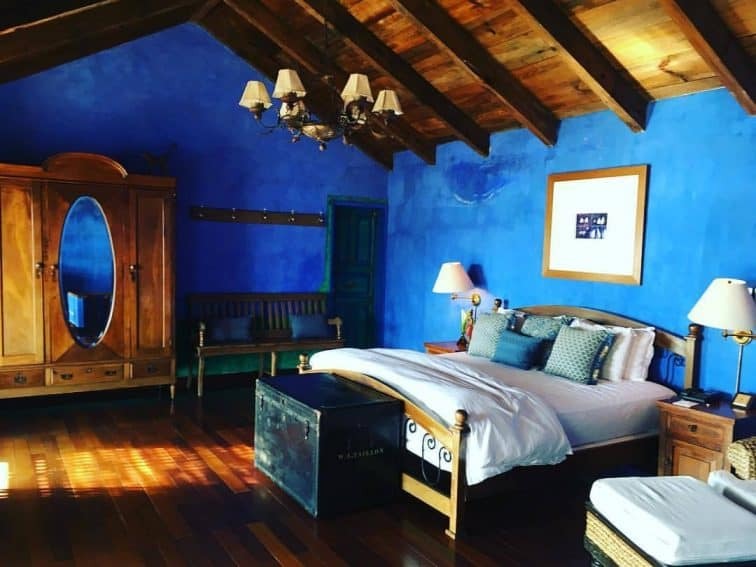 The word Atitlán actually comes from the Mayan word meaning “the place where the rainbow gets its colors.” As a nod to this, many of the guest room beds in the hotel have a “pot of gold” trunk at the foot. 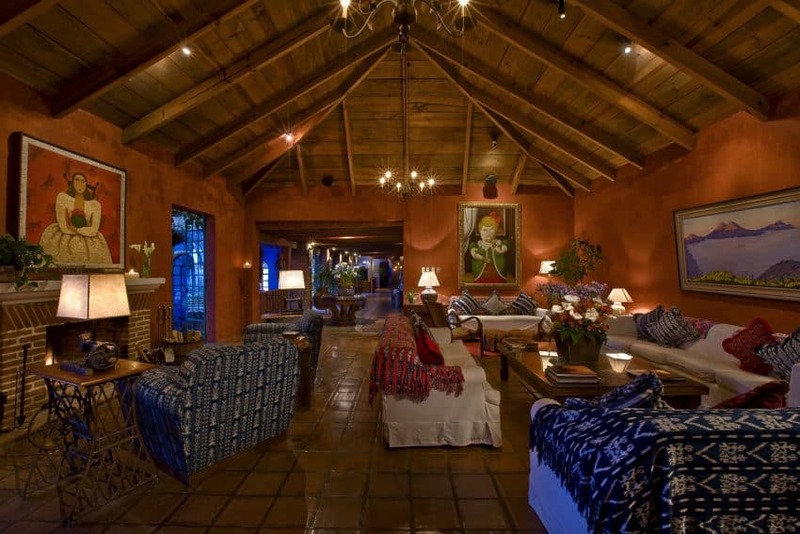 Villa Palopó is contemporary, decorated with African tribal relics and Indonesian wood furniture. Built in 2006 as an exclusive extension of the hotel, the very private villa is perched 150 cobblestone steps above the main hotel and offers three guest rooms, along with a large living area with fireplace and full kitchen with open dining room. Floor-to-ceiling windows and huge open terraces showcase both the views and the villa’s infinity pool. Golf cart service is available within minutes to whisk guests between the villa and main building. Guests can rent a room here individually, or book the entire villa — in which case, butler service is provided. The living area of the main hotel building provides a comfortable place for guests to relax and peruse the amazing collection of photographs, artisan work, and antiques that fill the space. This area opens up with wide glass doors to the terrace and restaurant, with stunning views of the lake below and three volcanoes on the horizon; and allows the breezes and sunshine to flow in. To the left of this area is a cozy bar with an authentic, old-fashioned jukebox and small seating area to enjoy a handcrafted cocktail created just for you. There are two solar-heated pools: one at the main building, and another (with an infinity edge) above at the villa. Both pools feature oversized lounge chairs and Jacuzzi tubs. A small fitness gym is available. Spa treatments can be booked in the privacy of the guest rooms or a small onsite treatment room. A unique and calming touch of the massage therapists is the brief Mayan prayer that is whispered at the beginning of the treatment, setting the perfect tone for healing and relaxation in this unique environment. Dining with spectacular views of the big Lake. Painting a home with the Pintando Santa Catarina project. 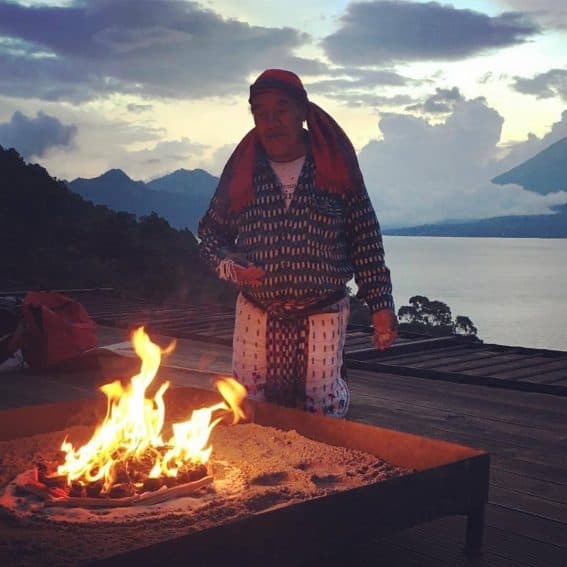 The staff can also set up a variety of cultural tours and ecotourism activities around Lake Atitlán and its surrounding towns, and a small handicraft shop selling authentic Mayan arts and crafts is onsite. During my stay, I visited the incredible Pintando Santa Catarina project — a community artistic endeavor that repaints the homes and businesses of the village, in which the residents have a vested interest. 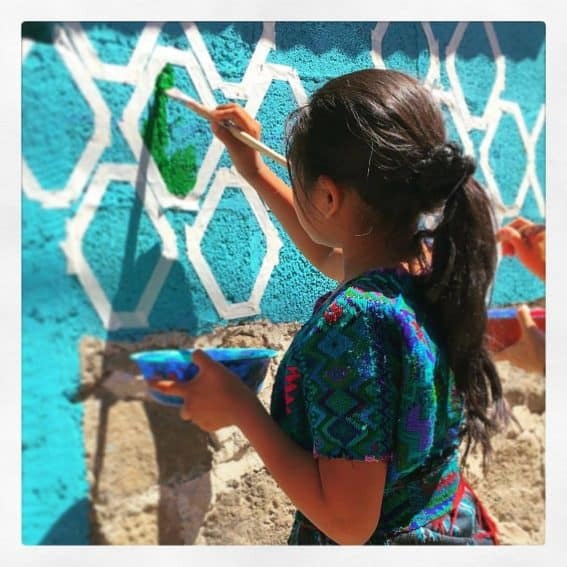 It was amazing to see this joint effort that was beautifying the town with vibrant, traditional Guatemalan colors, and to paint with a family there. We also took a boat across the lake to the nearby town of San Juan, known for its textile weaving and ceramics industries. But perhaps the most special experience I had at Casa Palopó was the Mayan shaman blessing on the last evening. Held outside the villa on the bluff overlooking the lake, just after sunset, the traditional ceremony took place using the elements of fire, air, water and earth. Mayan Shaman Blessing at Casa Palopó, Guatemala. Taking the helicopter to or from Casa Palopo is an amazing experience. An especially noteworthy feature is the helipad onsite; many visitors skip the three-hour drive from Guatemala City and arrive via helicopter — which is not only a luxury amenity available to book through the hotel but also an unforgettable sightseeing experience for the views. 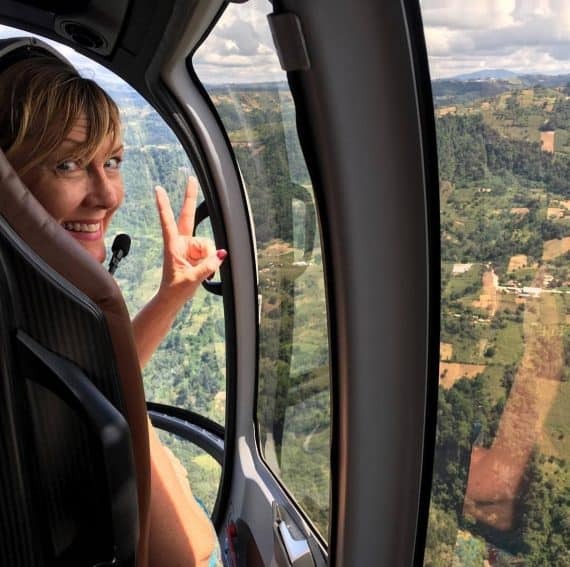 In my case, I arrived by car but returned to Guatemala City by helicopter — a truly memorable end to my stay at Casa Palopó and an exciting adventure! Taking the helicopter to or from Casa Palopó is an amazing experience. Great post with beautiful pictures and information. It’s really awesome. Thanks for sharing. I recommend taking the helicopter to this hotel in order to avoid having to see the thousands of malnourished Mayans living on subsistence farming while at least someone in their family is working in plantations on the coast for approximately $2 per day. God forbid you experience any remorse.